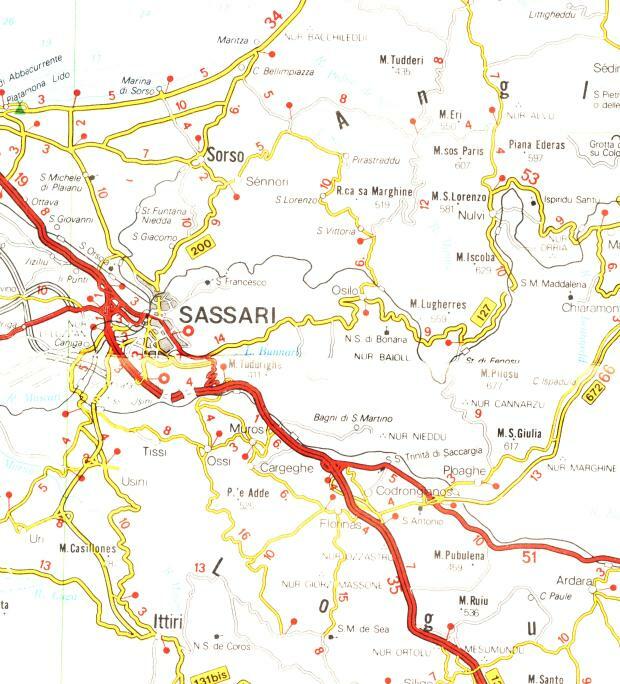 Starting from Sassari, taking the way to Cagliari along the street 131 we turn, passed 15 km, in the direction to Olbia on the street 597. Here, passed only 1 km from the turn, we found today's goal. 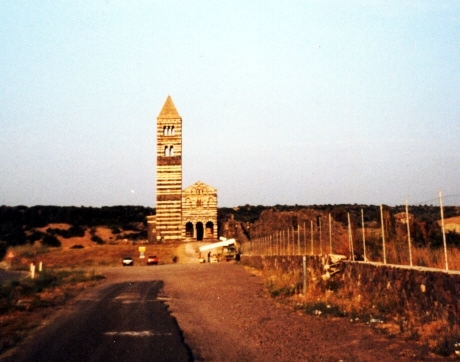 What you seen is surely suggestive: in the middle of the plain of Codrongianos, with granite mountains at north-east, stands the basilica dedicated to the S.S. Trinità di Saccargia. 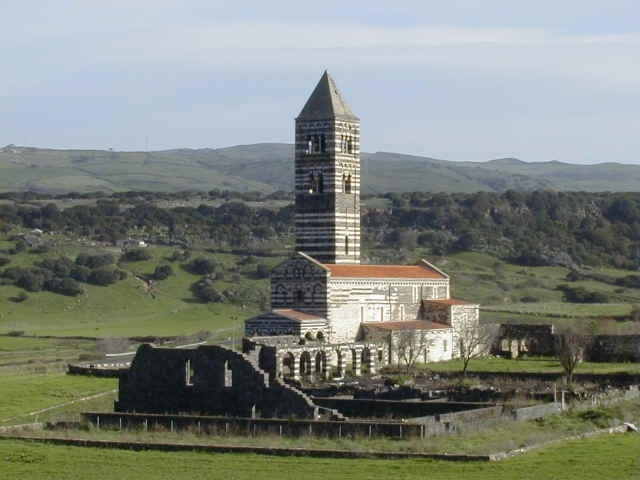 I think that what impress you is not the size of the buildings: the front of the basilica is only 10 m large. What really impress is its height, and especially the bell tower's height of 41 m: this height means the idea of a place of prayer directed to the heaven. 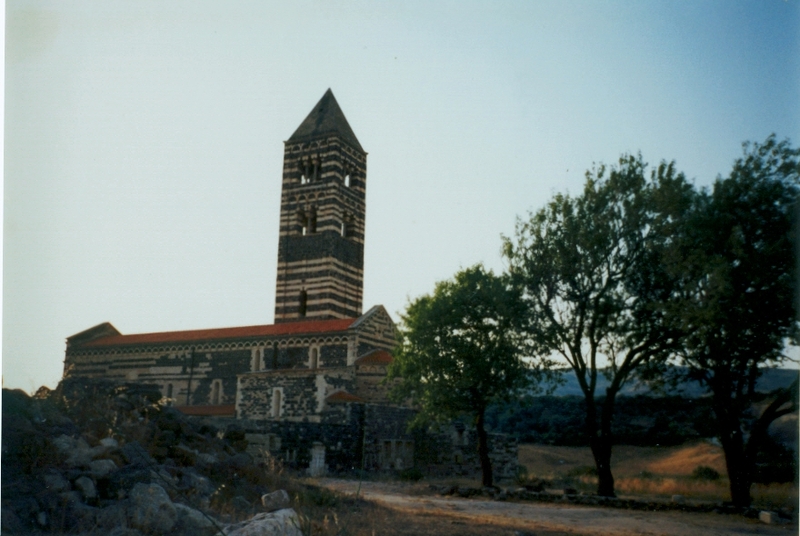 Especially in the photo number two, we can notice that the church, having a single nave, is a little more large than the bell tower's base, that is 6 m large. 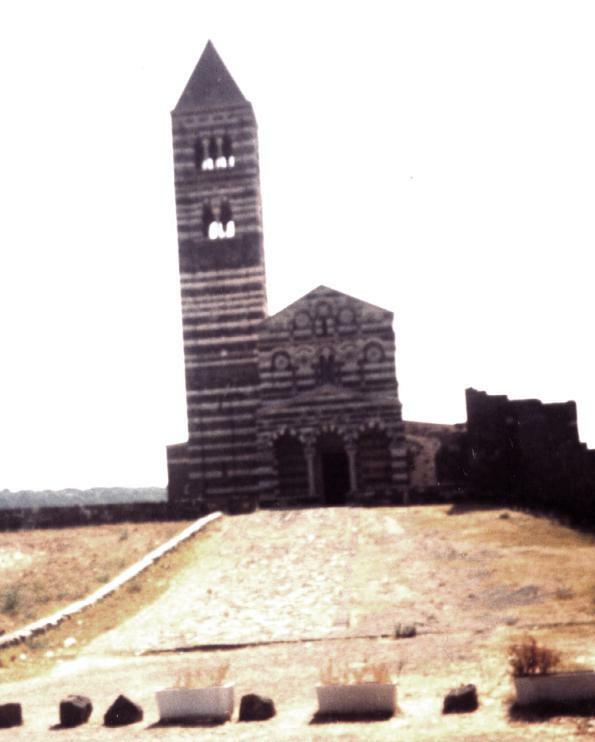 If we see the church from the back-left side, we notice the recently restored rests of the monastero erected by the Camaldolensi monks with the basilica in 1117. The big dimension of that rests, near of the little church, make you aware of how rich and powerful were the monks themself. 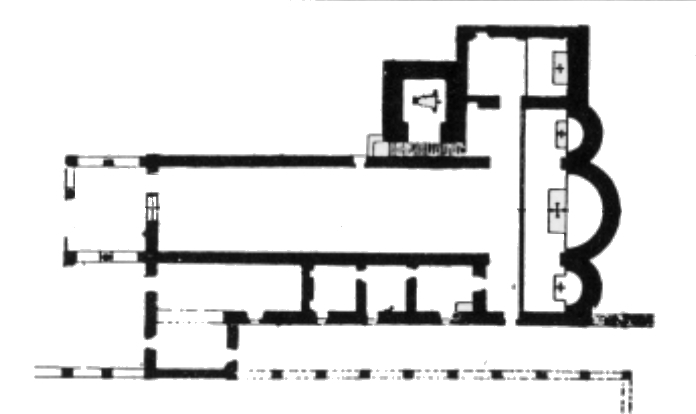 We have another curiosity reguarding the bell tower: its height have the same mesaurement of the length of the church, as you can see from the basilica's plan. 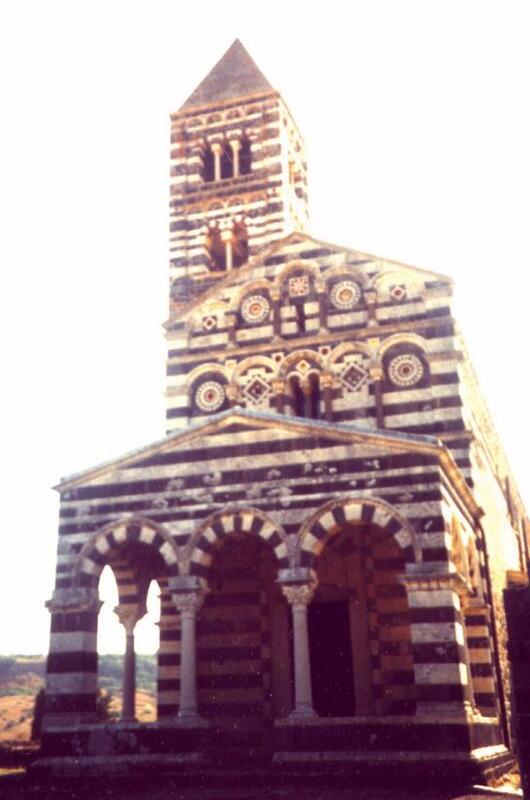 This photo of the basilica's portico show that this have been made in a different period from the church: the alternation of the calcareous and basaltic stones and the height of the stones themselfes are differents. 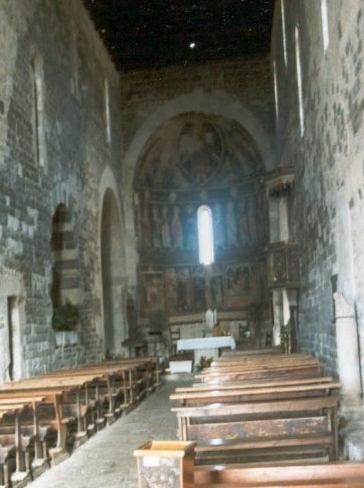 Entering this simple church, we found that the single high and narrow nave and the short transept, makes struck dump the tourist and suggested it with its silence, its semi-darkness, and the seen of the wood capriate perfectly restored in 1894. 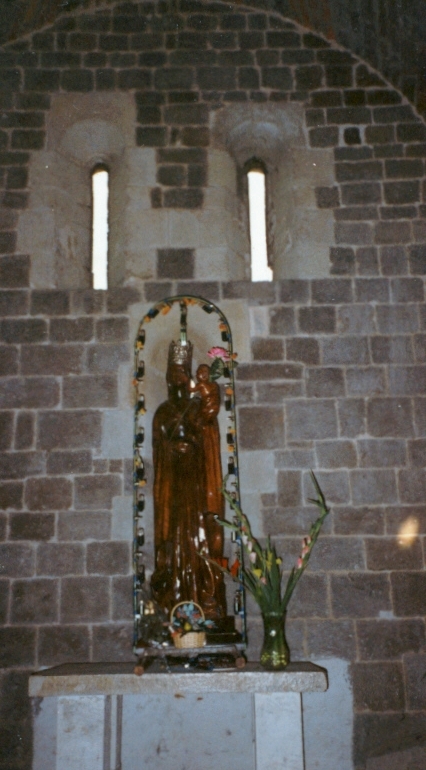 The only pictorial element in the basilica is situated in the apse. The fresco, made around the year 1300, never restored and well conserved is in three layers. 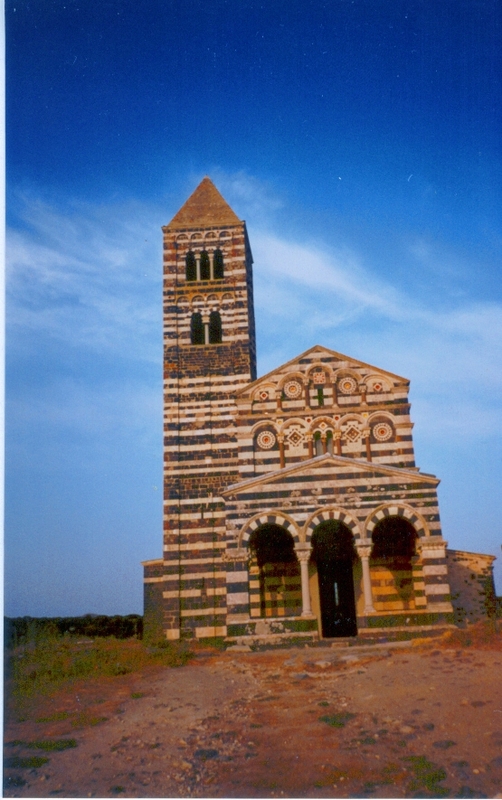 This choice has been made to means the elevation of the man from the earth, rappresented by scenes of Cristo's life in the lower part, through the Church, rappresented by the twelve Apostle, to the wonderful Heaven with Serafini Angels and the Beatitude of God rappresented by an image of the Trinity which the church is dedicated to. 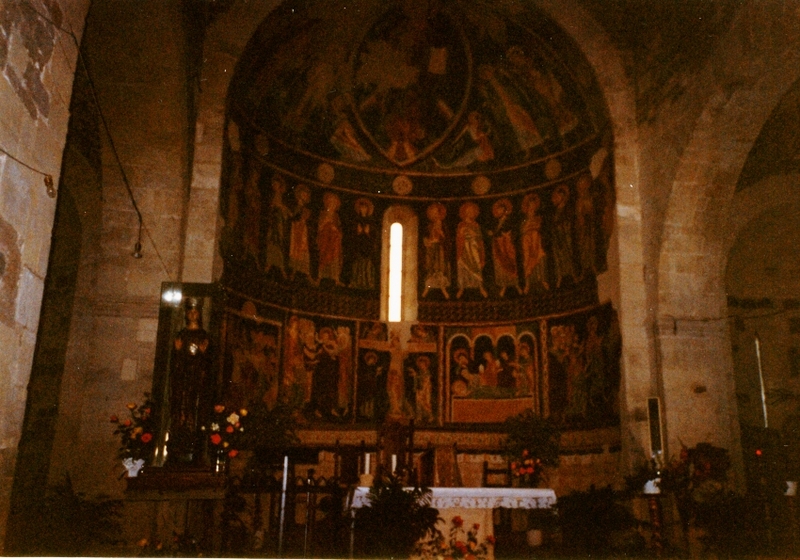 The two photos aside are taken respectively from left and right side of the transept. 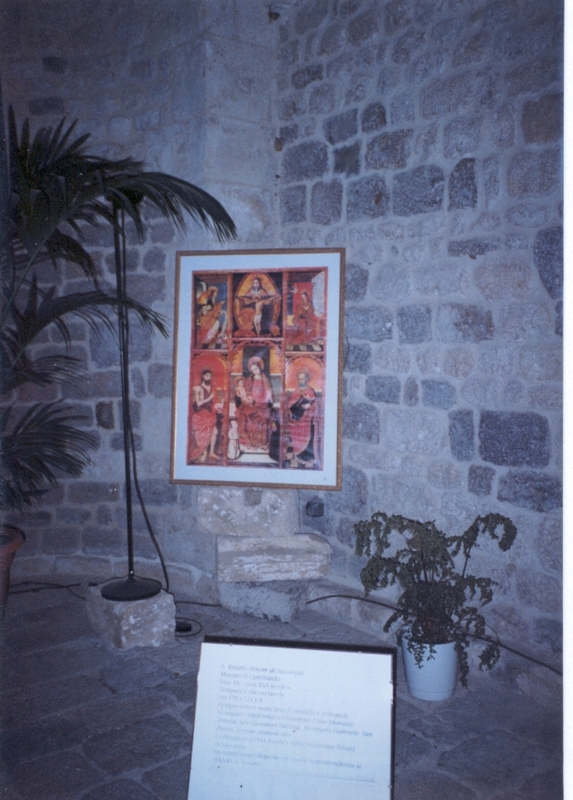 On the left, in the way to the bell tower we found a nice wood statue of the Virgin with Bambino, while on the right we found a photo showing same details of the fresco.